RIYADH (Reuters) - Saudi Arabia said on Wednesday it would not penalize foreign banks boycotting an investment forum in a message of reassurance for a gathering overshadowed by a global outcry over slain journalist Jamal Khashoggi. The kingdom's powerful Crown Prince Mohammed bin Salman is due to speak later at the meeting of international investors in his most high profile remarks since the columnist, one of his most prominent critics, was killed in Istanbul on Oct. 2. The world's top oil exporter has come under increasing pressure over the killing of Khashoggi, a critic of the crown prince, in a crisis that has strained its ties with the West. President Donald Trump, in his strongest remarks yet, said Prince Mohammed bears ultimate responsibility as Saudi de facto ruler for the operation that led to Khashoggi's death, explaining the prince is "running things" in Riyadh. Saudi Arabia first denied any involvement in Khashoggi's disappearance after entering the consulate but a Saudi official eventually attributed the death to a chokehold. Turkey has dismissed Saudi efforts to blame rogue operatives and urged the kingdom to search "top to bottom" for those responsible. Dozens of Western politicians, top world bankers and company executives boycotted this year's Future Investment Initiative conference that opened in Riyadh on Tuesday, but the kingdom showed it could still do business by signing deals worth $50 billion on the first day. The Saudi central bank chief said foreign banks abstaining from the event would not be penalized and may apply for licences to operate in the Gulf state, the Middle East's largest economy. "We, at the central bank, deal in complete professional manner whether with local or international banks," Ahmed al-Kholifey told Saudi-owned Al Arabiya television. 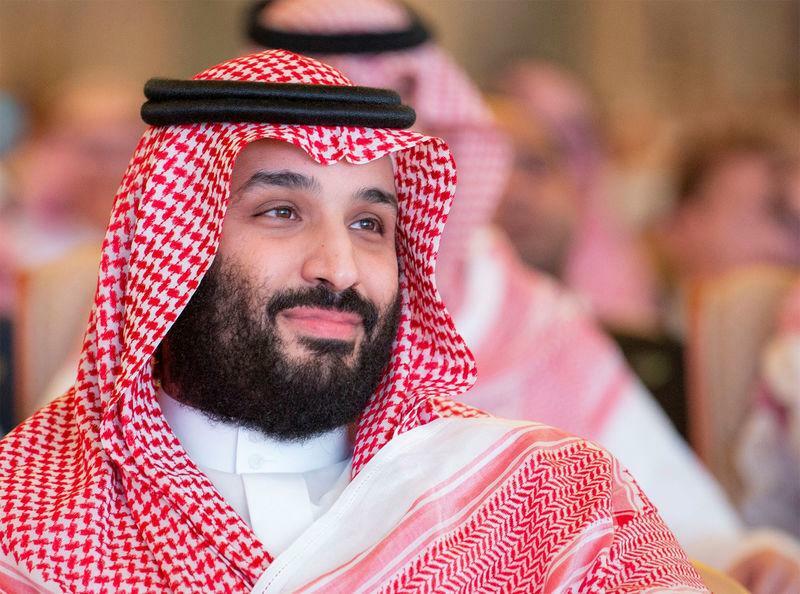 The crown prince, the kingdom's de facto ruler and architect of its reform drive, is scheduled to speak at the event in the late afternoon after making a brief appearance on the opening day, declaring the event as "great - more people more money". He wil be accompanied on the panel by the crown prince of Bahrain, which sent a 110-strong delegation to the event, according to a Bahraini delegate. The United Arab Emirates, another Gulf Arab ally, also made a big showing, led by UAE vice president and Dubai ruler Mohammed bin Rashid Al Maktoum. "They are circling the wagons, rallying the allies in order to weather the storm," a Saudi businessman told Reuters. Prince Mohammed, known as MbS, did not address the forum on Tuesday. He had arrived after attending a meeting at which his father and strongest supporter King Salman received members of Khashoggi's family, including his son Salah. State news agency SPA published pictures of the meeting, including one of the crown prince shaking hands with Salah, who seemed ill at ease. The prince told Bloomberg earlier this month that Riyadh would announce an "amazing deal" at FII this year, where the mood has been subdued compared to the 2017 inaugural event. Despite the boycott by big hitters, including in Wall Street, of the investment conference, some senior international bankers including from HSBC and Japan's biggest lender MUFG attended in a sign that global banks were reluctant to walk away from lucrative Saudi deals. Lucid Motors chief technology officer Peter Rawlinson was also present and the U.S. company had a dedicated stand at the venue, placing a sleek grey car in a hallway at the opulent Ritz Carlton Hotel where the three-day event is being held. In September Saudi Arabia's Public Investment Fund agreed to invest more than $1 billion in Lucid as part of Saudi efforts to diversify the oil-dependent economy. Russia's large delegation is led by Direct Investment Fund head Kirill Dmitriev, who said on Tuesday that while Khashoggi's killing needed to be investigated and the culprits punished, the Saudi economic and social reform drive could not be ignored.